Humble ingredients often make the best dishes and onions are the secret weapon in everyone’s pantry. What is not improved by adding an onion? I start nearly every dinner with a diced onion, some olive oil and a hot pan. Every culture’s cuisine has a similar starting point – mirepoix, Cajun trinity, sofrito, battuto, recaíto – a starting base of onions and a mix of other vegetables that create a flavorful base. There may be carrots and celery, or green pepper, or include chilies or maybe herbs but it always starts with the humble onion. Cook onions nice and slow and entire dishes can be built around those deeply caramelized, flavorful strands. French Onion Soup is just one example that illustrates the magic of a caramelized onion. This is another one of those recipes. Everyone needs a good simple dish for entertaining, to bring to a party, or maybe part of a light dinner. 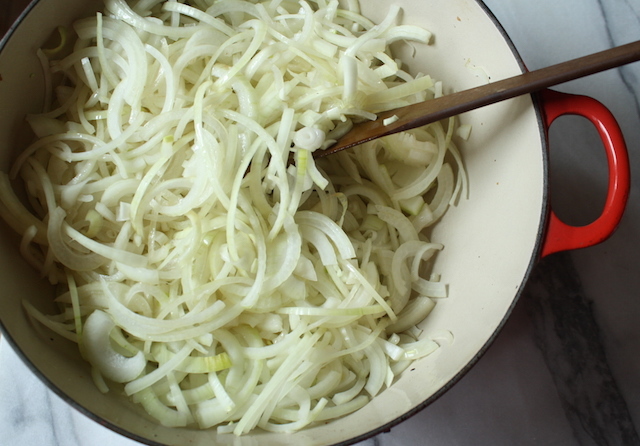 Like many of these dishes, it starts with a big mess of sliced onions. A lot of onions, enough that the slicing will take a while and might make you cry a little. (Key here is a very sharp knife and to breathe through your mouth.) Add that giant pile to a pan in which you’ve already cooked some bacon, and stir them around to coat in the rendered fat. Bacon fat is a wonderful thing, one we should not fear and should use at every opportunity for the wonderful flavor it imparts to a dish. Then slowly over moderately low heat, cook that big messy pile until it breaks down, caramelized and turns deep, rich shades of brown. 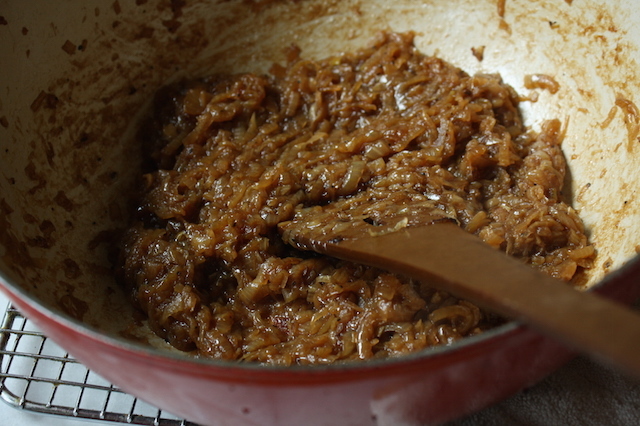 I have a little trick for caramelizing onions. Start with a covered pot for about 10 minutes. Give a stir and do the same thing again. At this point, the onions will have steamed a little and broken down quite a bit. Then cook low and slow uncovered, giving a stir every once in while, scraping up any caramelized browned bits from the bottom of the pan. It will still take about 45 minutes, maybe 60, to get a nice golden caramelization but that first bit gives a nice head start. While you’re waiting, turn some music on and dance about. Get your groove on, because this process cannot and should not be rushed. Don’t leave that pan alone; it needs a stir every so often. You don’t want to invest all this time only to find a burnt mess. Now here’s where the festive part comes in. Deglaze that pan with a full-bodied, flavorful beer. Use the good stuff here; this is no place for a Miller Lite. You want flavor so make it worth something. I used the always-delicious New Glarus Spotted Cow, mainly because it is wonderful here but also because there’s ½ of the bottle left and I was perfectly happy to day drink that on a random Wednesday morning. Tumble those onions onto a sheet of puff pastry which has been lightly smeared with Dijon mustard, sprinkle the bacon on top and bake the tart until it’s golden brown and crispy, adding a sprinkle of parmesan halfway through. It’s magic – a few simple ingredients is turned into something wonderful. Onions, mustard, beer, bacon. It doesn’t sound like much on it’s own but together? You’ve created something special. Bring this to a party and watch it disappear. Serve it for dinner with a nice salad and a cold glass of something crisp and bright and go to bed happy. STRESS THERAPY BAKING FACTOR: ONE TWO SWITCHEROO. Humble ingredients turned into something spectacular. It’s really very easy though you can’t rush those onions. Turn up the heat to move them along at a quicker pace and they cook too quickly, taking on burnt, over-toasted notes rather than the deep, sweet-savory flavors of a properly caramelized onion. If you’re in a rush, do the onions a few days ahead when you have the time to linger. They’ll hold in the fridge just fine until you need them. I like a full-flavored ale, like Spotted Cow, but realize that one is impossible to find outside of Wisconsin. Just make sure you use something you like to drink. A darker beer, like a stout is fine too – the flavor will be more pronounced but tasty all the same. I also like to cut little cubes from a slab of bacon but if you can’t find a big chunk, look for thick cut bacon in the grocery store. For the pastry: On a sheet of parchment paper or a silicone baking liner, gently unroll the puff pastry and give it a roll or two with a rolling pin to even out any folds or seams. 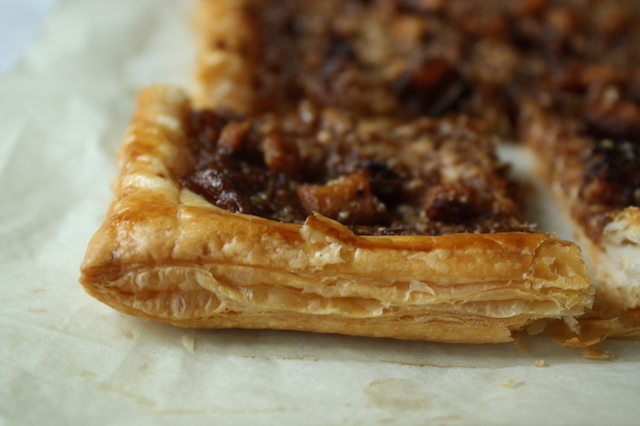 With a sharp knife, very carefully score a ½” border on all sides of the pastry taking care not to cut all the way through the pastry. 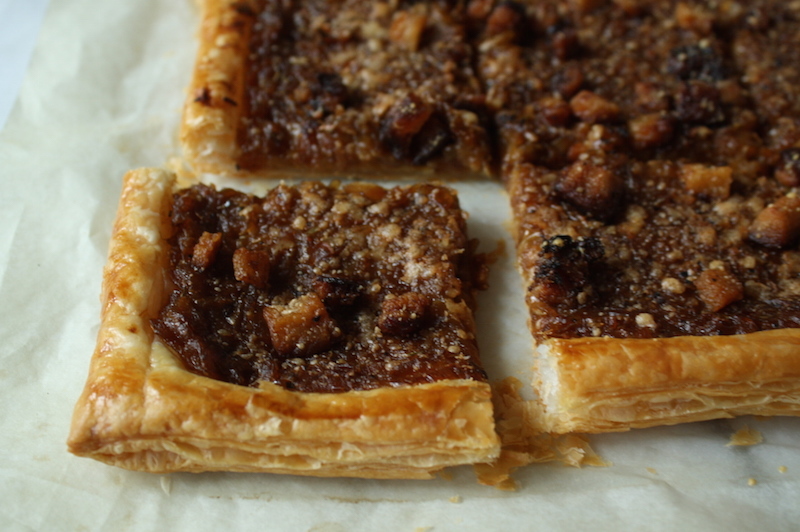 Slide the pastry onto a sheet pan and place in the refrigerator to chill while you prepare the onion filling. For the filling: heat a large, heavy bottomed pot (like a Le Creuset) over medium-low heat, add the bacon and cook, stirring occasionally, until fat is rendered and bacon is barely crisp, about 6 minutes. Place a small strainer over a bowl and drain the cooked bacon. Measure 4 Tablespoons of the rendered bacon fat back into the pan (save the rest for another use.) If you don’t have 4 Tablespoons, use olive oil for the remaining amount. Add the onions to the pot with the salt and pepper and stir to coat. On medium-low, cover the pot and let the onions steam for about 8-10 minutes. Uncover, stir and recover and let cook for another 8-10 minutes. Uncover, stir and continue to cook uncovered, stirring and scraping the pot bottom every so often until golden brown and caramelized. The entire process will take about 45 minutes total, maybe longer. Add the caraway seeds and beer to the pan, scraping up any browned bits from the bottom of the pan, and cook until there is no more visible liquid. Turn the onions into a large bowl, stirring occasionally to cool. Once the onions have cooled, stir in the crème fraîche (or sour cream) and thyme and adjust the salt and pepper if needed. Place a rack in the lower third of the oven and preheat to 375°F. 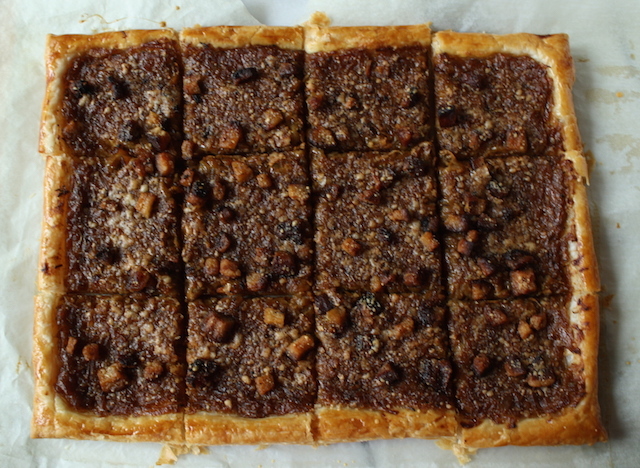 Assemble the tart: Remove the pastry from the refrigerator and with a fork, poke a bunch of holes on the inside square only. Do not pierce the outer border. This will prevent the center from puffing during baking. Poke as many holes as you have the patience for; the more the better. 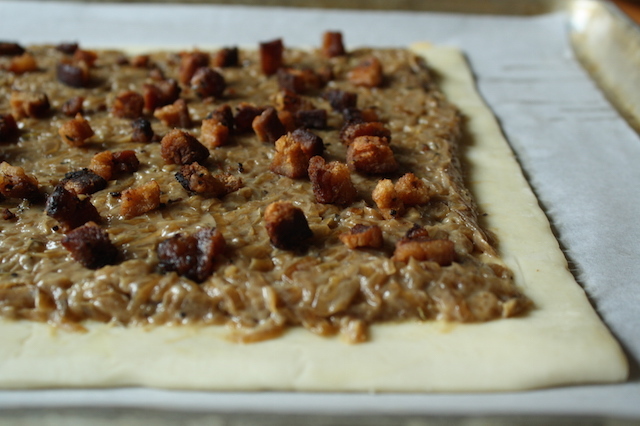 Evenly spread the mustard on the pastry center in a nice thin layer, leaving the border clean. Spread the onions over the mustard, leaving the border clean. Sprinkle the bacon evenly on top of the onions. Beat together the egg and the milk (or cream) for the egg wash and lightly brush the outside border edges of the pastry. Bake for 10 minutes then sprinkle the parmesan on top and bake for another 10-15 minutes until the pastry is golden brown and crisp, 20-25 minutes total. Cool in the pan on a rack about 10 minutes, before cutting. Serve warm. Do ahead: you can cook the bacon and onions (and mix with the sour cream and seasonings) and store in the refrigerator up to 2 days. The pastry can be prepared up to one day ahead and stored in the refrigerator wrapped tightly. 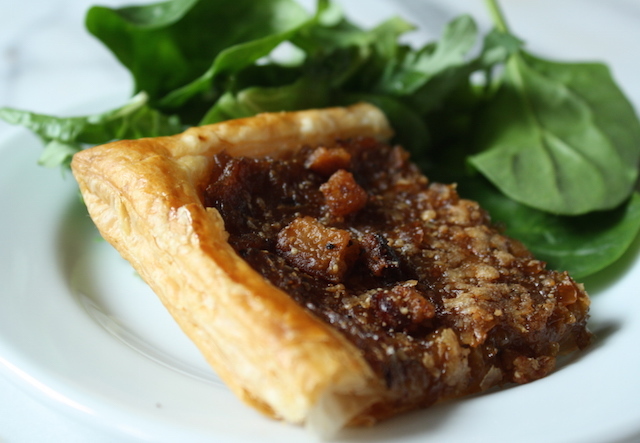 You can fully assemble the tart up to 2 hours ahead and store in the refrigerator before baking. The tart is best freshly baked and served warm. there is no place for a Miller Lite…. this tart sounds wonderful. I always have a bowl of bacon fat in the fridge, thanks to my grandma. I have a home brewed chipotle ale I’ve been itching to use in a recipe. I also have a wild pheasant and mushroom tart I make when my husband goes pheasant hunting (thanks honey?). If you’ve never had wild pheasant, think chuck steak, if chuck steak cost about $100 a pound. Oh well, it’s the memories that count, right? I think I’ll throw everything together and make a chipotle ale, pheasant, onion, and mushroom tart this week. Oh that sounds good. Report back!